The Agilent 89600 Series VSA. AGILENT Technologies has introduced the first combination of solutions that tightly integrate the digital signal capture power of Agilent's logic analysers. 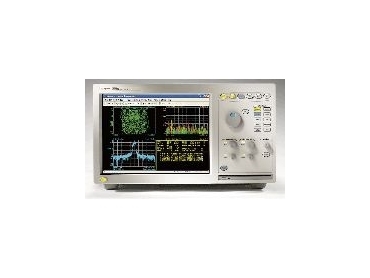 The Agilent 89600 Series VSA (vector signal analysis) software is a tool for radio frequency (RF) signal analysis. The 89600 Series is a powerful digital vector signal analysis measurement system that delivers precise, accurate modulation measurements on the digitised communication signals found in today's DSP (digital signal processor) based radio transceivers used in mobile phones, base stations, satellite and military communications systems and radar applications. For the first time, digitised transmit and receive signals found on data buses between the baseband and RF blocks of digital radio applications can be analysed in the time, frequency and modulation domains within a logic analyser just as if they were in full analogue form. This allows a view into circuit behavior at the digital interface between the baseband and RF integrated circuits. Agilent's logic-analyser-based Digital VSA solution allows designers to apply the full power of a vector signal analyser to waveforms while they are still on the data buses in digitised form. It also provides a unified user interface within the logic analyser that allows baseband and RF teams to share the same measurements and more easily solve cross-domain problems. By capturing the transmit and receive data buses (digital I&Q or digital IF) and demodulating them within the Agilent Digital VSA solution, communication system architects have greater insight into true circuit functionality, thus quickly identifying design flaws and accurately characterising circuit performance. The innovative test capabilities of Agilent Digital VSA technology are provided within a single instrument by the tight integration of the 89600 Series software with a logic analyser. These unique capabilities extend the capture and analysis power of Agilent's logic analyser products by providing advanced tools for making modulation quality measurements on a variety of digital communication signals. In addition to the full capability of the Agilent 1680, 1690 and 16900 Series logic analysers, the Digital VSA solutions provides analysis of the digital baseband or digital IF signal in a variety of different formats, including Scalar baseband, Scalar IF, complex I&Q, Magnitude & Phase and Phase Only. The system also offers flexible demodulations that measure carrier offset, error vector magnitude (EVM) and frequency error for QPSK, QAM, GSM, EDGE, WiMAX, W-CDMA; and multiple display formats, including phase vs time, frequency vs time, and spectrogram for rapid insight into complex signal behaviour.